This is a board book that manages to do something a little new (to me) in an ABC book – there is a hint of narrative as the various animals in the book progress through the letters of the alphabet. I have always thought ABC books for babies were more for parents than kids so being able to tell a story instead of just offering random objects or animals to get through the alphabet is refreshing. X marks the picnic spot. 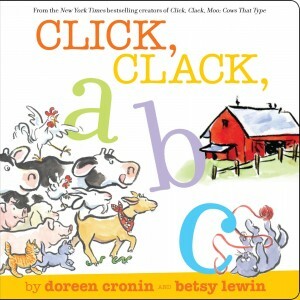 A great board book companion to Click, Clack, Moo. Do you have a favorite ABC book? I love Chicka Chicka Boom Boom, an alphabet book with a story and incredible rhythm. Of course, my kiddo attended a Montessori preschool that called letters by their sounds, rather than their names, but we kept reading that book all the same! I know a lot of people take the Montessori approach with the sounds, my mother in law jokes the alphabet is really just for later when you sing it to yourself while trying to put things in order or find something in a library. 🙂 We really like Chicka Chicka Boom Boom as well, there’s also a number version of it that my daughter enjoys.